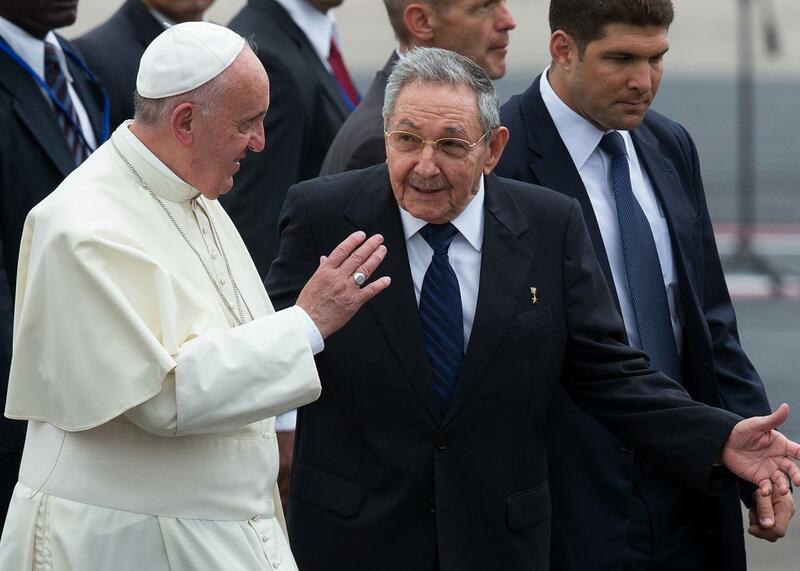 Pope calls on U.S., Cuba to improve relations. Pope Francis walks with Cuba’s President Raul Castro (R) as he arrives at Jose Marti International Airport on September 19, 2015 in Havana, Cuba. Pope Francis landed in Havana on Saturday afternoon for the start of a long-anticipated nine-day visit to Cuba and the United States. Cuban President Raúl Castro greeted the Argentine pope, whose “skullcap flew off in the Caribbean breeze,” notes Reuters. The pontiff wasted no time in praising the normalization of diplomatic relations between Cuba and the U.S., which he helped to broker. 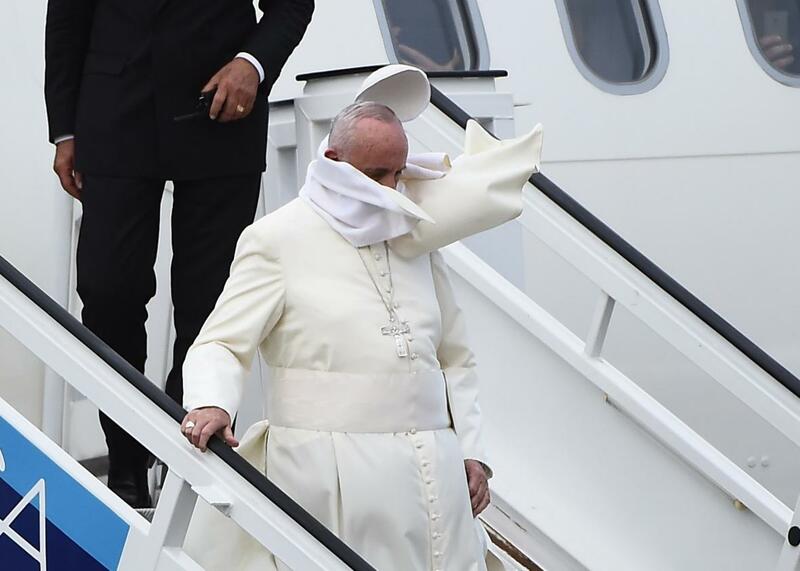 Pope Francis’ skull cap is blown away by the wind as he descends from the plane upon landing at Havana’s international airport on September 19, 2015 on the first leg of a high-profile trip that will also take him to the United States. The pope gave “an apparent not” to Cuban dissidents, noting he wanted to embrace “all those who, for various reasons, I will not be able to meet,” including Cubans abroad, reports the Associated Press. Francis also called on Castro to “convey my sentiments of particular respect and consideration to your brother Fidel.” The Vatican has said Francis may meet with the 89-year-old Fidel Castro. “It is possible that this happens,” Monsignor Federico Lombardi told journalists. Castro thanked the pope for his role in getting the United States and Cuba to resume diplomatic relations and also called on Washington to end the embargo, calling it “cruel, immoral and illegal.” The Vatican has said it hoped the pope’s visit would help bring an end to the 53-year-old embargo, notes the BBC. Francis is scheduled to arrive in the United States on Tuesday and meet with Obama on Wednesday.